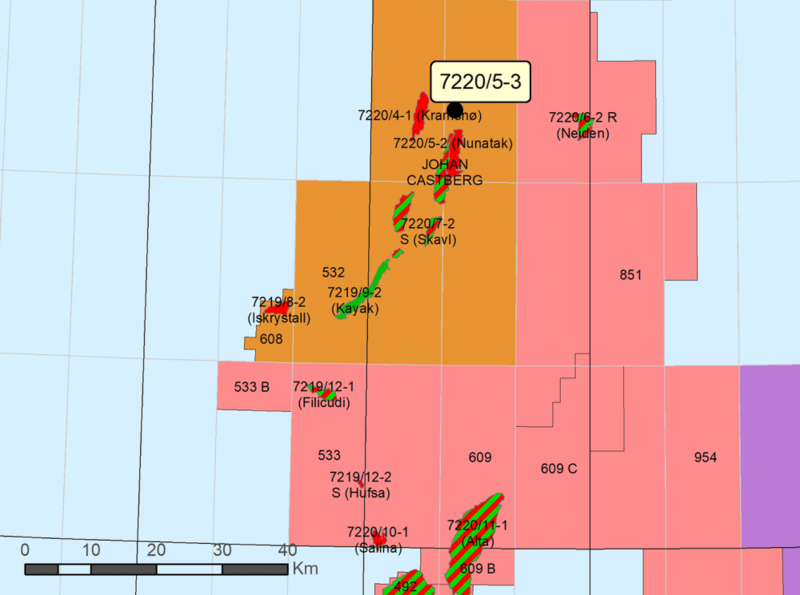 Equinor, operator of production licence 532, has concluded the drilling of wildcat well 7220/5-3. The well proved oil. The well was drilled about 8km north of the 7220/8-1 discovery well on the Johan Castberg oil field, and 225km northwest of Hammerfest. The well’s primary exploration target was to prove petroleum in reservoir rocks from the Middle Jurassic Age (the Stø and Nordmela formations). The secondary exploration target was to prove petroleum in reservoir rocks from the Early Jurassic Age (the Tubåen formation). The well encountered a total oil column of about 35m in the Stø formation, 30m of which was effective reservoir in sandstone with moderate to good reservoir quality. The oil/water contact was encountered at 1,415m below the sea surface. Both the Stø and the Nordmela formation are a little thicker than expected. The Stø formation has about 30m of water-bearing sandstone below the oil/water contact, with mainly good reservoir properties. The Nordmela formation has water-bearing sandstone layers totalling more than 100m with moderate to good reservoir quality. In the Tubåen formation, the sandstone layers have moderate to good reservoir properties. Preliminary estimates place the size of the discovery between two and four million standard cubic metres of recoverable oil. The discovery will be assessed with a view towards tie-in to the Johan Castberg field. The well was not formation-tested, but extensive data acquisition and sampling have been carried out. This is the ninth exploration well in production licence 532. The licence was awarded in the 20th licensing round in 2009. The well was drilled to a vertical depth of 1,750m below the sea surface, and was terminated in the Fruholmen formation from the Late Triassic Age. Water depth at the site is 409m. The well will now be permanently plugged and abandoned. Well 7220/5-3 was drilled by the Songa Enabler drilling facility, which will now drill five production wells on the Trestakk field in the southern part of the Norwegian Sea, where Equinor is the operator.